This Recovery Road Participants’ Guide is designed for use in conjunction with the Recovery Road Workbook. It is a very personal book that maintains a record of your own journey of recovery. The work book is packed with useful lessons and supporting quotes from acclaimed, inspirational authors. the heart of Jesus in His famous Sermon on the Mount. Recovery Road does not just focus on one issue or addiction like other 12-step programs. It is a practical tool for recovery from many of life’s regrettable situations. There is now a hope for the future and we no longer need to remain stuck in our habitual behaviours that tie us down and hold us back. Graham and Michelle Hood have been involved in life recovery since 2007 and are highly sought after national and international guest speakers and presenters. Their own amazing testimonies speak cogently of successful recovery. Mission Serenity is a special, not-for-profit group dedicated to Restoring Broken Lives. 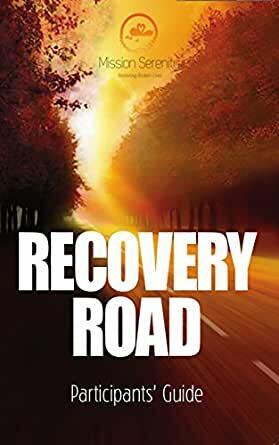 Recovery Road is a powerful tool that has changed broken lives filled with despair into futures vibrant with hope and purpose. May God bless you on your very own Recovery Road journey.